During the 1960s and 1970s, contemporary artists were supposed to free themselves from art spaces, white cubes and other commodified venues in favor of out-sized artworks, outdoor events and out-of-control live performances. Not so with US artist Keith Sonnier (b.1941), who always felt at home in the art gallery’s four walls, contrary to similar artists like Max Neuhaus or Bill Fontana. 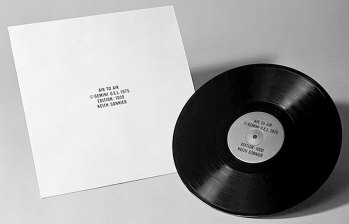 When this LP was released in 1975, Sonnier was a Leo Castelli protégé, with several solo shows in his New York gallery since 1972. 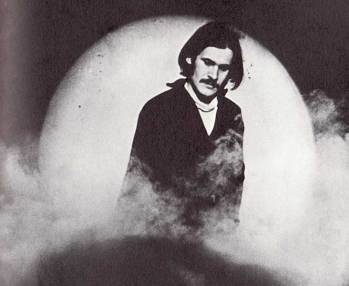 At the time, Sonnier was creating multimedia installations using live video, sound transmission and light. 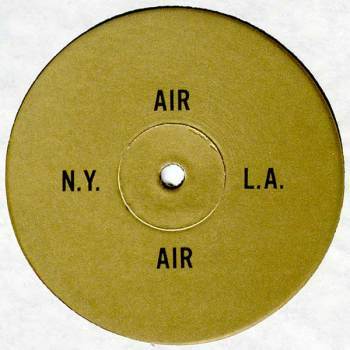 The Air to Air LP, published in 2 versions (see below) by Los Angeles gallery Gemini G.E.L. 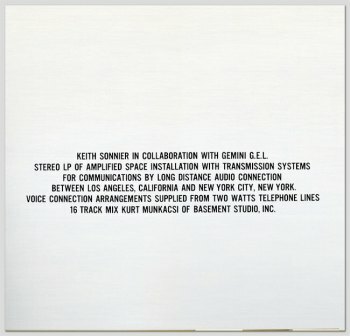 in 1975, documents a twin sound installation based on long distance phone connection between art gallery staffs and attendees, from New York to Los Angeles on side 1, and from Los Angeles to New York on side 2. 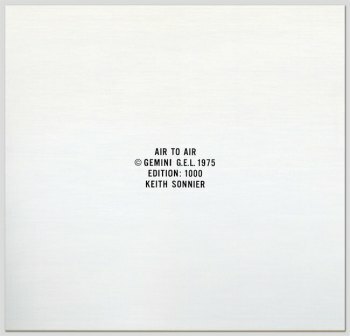 Ace Gallery in Los Angeles and Leo Castelli Gallery in NY presented the installation from February 8 to 22, 1975. I assume both exhibitions consisted of microphones and headphones hanging from the walls for volunteers to call the other Coast. The limited edition came with voice print diagrams printed in offset lithography. 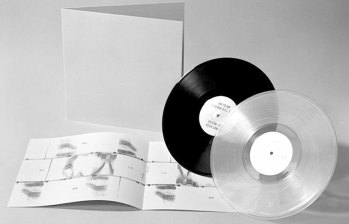 The LP’s sound work is based on casual conversations, static and insistent high-pitched tonality. A disturbing disjunction arises from the fact we only hear one speaker at a time, though several unrelated conversations are randomly superposed. One participant calls the experience ‘super-telepathy’. The final mix of disembodied voices speaking in the vacant space carries a feeling of impossible communication. If long distance phone calls can reduce the distance between people, this mix actually, and somewhat ironically, increase the gap between Los Angeles and New York, as if resisting the globalization to come. The record is produced by Kurt Munkacsi, Philip Glass’s official NY producer, who also worked for Brian Eno, David Bowie and Diamanda Galás, a.o. Thanks to reader Rainier for the rip and scans.